Robot Professional Wrestling Match, `Dekinnoka!6`, sponsored by Omata-san will take place at ROBOSPOT in Akihabara, Tokyo on Sep. 25th, 2010. The matches will be shown on `Ustream Dekinnoka Channel` from 3:00 pm to 7:00 pm (JST). You can see Promotion Video of Dekinnoka now. `Dekinnoka` in Japanese, means `Can you do it?`. As Omata-san has been loving real professional wrestling, the 1st Robot Professional Wrestling in Soka on Nov. 3rd, 2008 was planned and held by him. He explained the 'Robot Professional Wrestling' was not 'Wrestling' but 'Fighting Arts'. 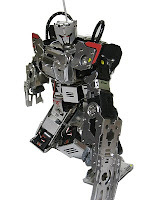 The purpose of `Dekinnoka` was not only robot fight but also to inform pleasure of robot. President Mister Tamao of Robot Pro-wrestling, who is Omata-san planned not only wrestling match but also the back story of each wrestler character such as a real pro-wrestling match. 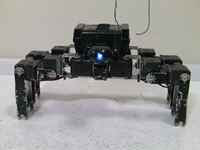 Anyrobot, not only biped robot but also even multi-legged or robot with wheels can join the KONDO TIME-LAG BATTLE ROYAL. 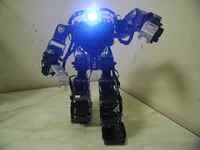 Ten robots have been invited applications from robot builders. BLACK TIGER L45 also applied the Battle Royal. At first two robot fight in the ring, after 3 minutes a additional robot joins the fight, then every 3 minutes another robot joins the fight. The ring rope of both side are removed for dropping out of ring. The winner is the robot survied on the ring. 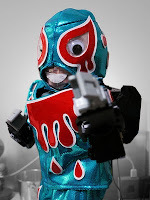 For discovering robot pro-wrestling characters, challenger robots against Saaga, Kanto Robot Pro-Wrestling Champion have been invited all of the world. The robot passed the examination fight against Saaga, will be able to join every Dekinnoka Pro-wrestling match. Dekinnoka!6 promotion video of the 2nd match, Kumataro vs Syonmao. A giant panda robot 'Syonmao' from Big Beijing Pro-Wretling will fight against `Kumataro`. 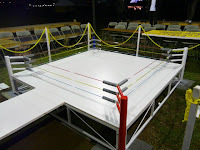 For Robot Professional Wrestling Match, the ring surrounded by 3 ropes with red and blue corner like a real Professional Wrestling is preparing. He carried out 7 times `Dekinnoka as 1, 2, 2.5, 3, 3.5, 4 and 5` during 2 years. `Deknnoka` has been also supported by the members of Kanto-training gumi(group). Reports of `Dekinnoka 2` ,`Dekinnoka 3` and `Dekinnoka 5` have been uploaded in this blog. Fantom by Black-san will join as a referee robot. Fantom fought against Kawasaki Robot `Remesis` in the Dekinnoka 1. He was injured his neck at the match and retired as an active wrestler. Videos were also uploaded to the 'Dekinnoka Official Site` by Omata-san. You can watch the details of the Robot Professional Wrestling videos by clicking each 7 poster of `Deinnoka 1, 2, 2.5, 3, 3.5, 4 and 5`.